MainAll NewsMiddle EastAnalysis: Is Israel planning IDF action against Iran in Syria? Analysis: Is Israel planning IDF action against Iran in Syria? Netanyahu and the IDF CoS seem to be hinting that they are losing patience with the world's passivity as Iran gets nearer to Israel. While much of Israel’s media, the large TV broadcasters in particular, were busy with yet another ‘scandal’ involving the Prime Minister, or more precisely his son Yair, something important happened in Syria. It remained largely unreported but delivered evidence that the war there is far from over and could even escalate into a larger conflict. On Monday night, the Israeli Air Force again conducted a strike on a weapons storage facility in the Damascus region with the Syrian Observatory for Human Rights reporting the site was a missile silo run by Hezbollah. The IAF strike was part of Israel’s “multifaceted effort” to combat growing Iranian influence over Syria and the encroachment of Iranian-backed Shiite militias on Israel’s northern border. Israel has already carried out more than 100 strikes against Iran-related targets in Syria, according to the commander of the IAF Maj.-Gen. Amir Eshel, who in August 2017, said the attacks were carried out to prevent Iranian deliveries of advanced weapons to Hezbollah. Since the beginning of 2018, PM Netanyahu has convened his security cabinet to hold a series of “extremely significant” discussions on the increasing Iranian threat to Israel from Syria. “The Middle East is raging around us, and what concerns us the most are Iranian efforts to establish military bases in Syria,” Energy Minister Yuval Steinitz, a member of the Israeli security cabinet, told Galatz, the army radio in Israel. “The prime minister is leading a multifaceted campaign to stop this entrenchment,” Steinitz revealed while adding that the attempt to stop Iran from taking over Syria could take a “few years”. “It’s a process that will take a few years, but we are determined to prevent it,” Steinitz told the Israeli news site Ynet. Earlier, TV Channel 10 in Israel reported PM Netanyahu had started a new diplomatic offensive to draw world attention to what is happening in Syria where the Iranian-backed pro-Assad coalition is rapidly advancing in its quest to retake all of Syria. The Governmental Press Office (GPO) later confirmed the Channel 10 report and said Netanyahu had spoken to British Prime Minister Theresa May, Polish Prime Minister Mateusz Morawiecki, Romanian President Klaus Iohannis and President of the Romanian Chamber of Deputies Liviu Dragnea about the “regional” situation. Another GPO report said the Israeli PM had also discussed the Iranian threat to Israel with Chancellor Angela Merkel of Germany. In December, Iranian-backed Shiite militias - which are now part of the Syrian army - came within 4 miles of the Israeli border on the Golan Heights during a blitz against the Islamist rebel groups which until recently controlled much of the border area on the mountainous plateau. Hezbollah is now overseeing an operation which aims to drive the Sunni Islamist rebel groups- including Islamic State - from their positions along the Israeli border on the Golan Heights, according to NzivNet. The new Israeli ‘offensive’ against the Iranian presence in Syria came after the pro-Assad coalition made new advances in the Sunni- dominated Idlib province in northern Syria. The coalition also advanced east of Damascus in Ghouta where Islamist rebels of the Harakat Ahrar Al-Sham militia are losing ground. This week, this part of the news about Syria remained largely unreported by the Israeli media. 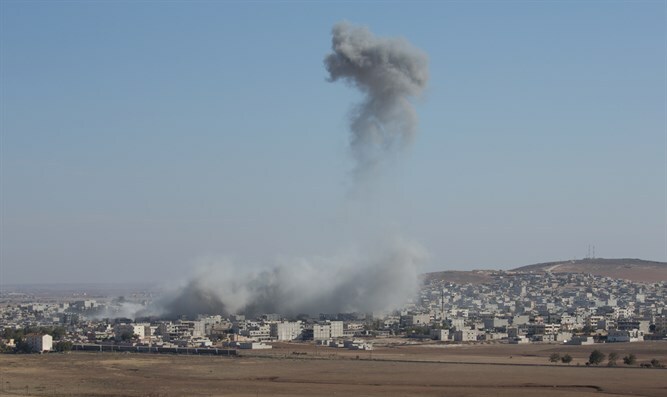 In Idlib, the situation has caused the recently formed ‘pro-peace’ coalition of Turkey, Iran and Russia to fall apart. The Syrian army, supported by the Russian air force, encircled Turkey-backed Islamist rebels of the Hayat Tahrir al-Sham militia, which was formerly known under the name Jabhat al-Nusra, and Turkish troops in the city of Idlib. The move immediately caused a crisis between Turkey on one hand and Russia and the al-Assad regime on the other hand. The three countries recently joined forces in order to reach a settlement in the six-year-old Syrian war and to counter the Kurdish-dominated and US-backed Syrian Democratic Forces who control most of Syria’s border with Turkey. Turkish foreign minister Mevlut Cavusoglu claimed Assad’s army and Russia were attacking moderate rebels under the pretext of fighting the Hayat Tahrir al-Sham Islamist umbrella organization of Islamist rebels. The Turkish FM furthermore said the Syrian-Russian offensive in Idlib was a violation of the “de-escalation” agreement reached by Ankara, Moscow, and Tehran in Astana, the capital of Kazakhstan, in September 2017. Idlib is one of the de-escalation zones in Syria and is home to a large majority of Sunni Muslims who form the hard-core of Hayat Tahrir al-Sham. The other three de-escalation zones are located south of Hama, east of Damascus and in the area of the Syrian-Israeli border where the Iranian-backed pro-Assad coalition is also trying to use the Astana agreement to advance its goals. On Tuesday, Turkey summoned the Russian and Iranian ambassadors to the country to demand clarifications about the moves of the pro-Assad coalition in Idlib. Erdogan’s mouthpiece the newspaper Yeni Safak claimed the offensive against the Turkish-backed Sunni Islamists was coordinated with ISIS and had the full support of Russia and Iran. Erdogan sees himself as the protector of the Sunni Arabs in Syria and had earlier offered to send his army as far away as the Israeli border to police the Astana agreement, an offer rejected out of hand by Iran which has other plans for Syria. Iran wants to establish a naval base on the Mediterranean coast southeast of Idlib and wants to contain the threat of the Turkey-backed Islamists to the Assad regime. The views of the mullahs in Tehran are aligned with Russia’s preferred outcome of the Syrian war. Putin too wants to contain the Hayat Tahrir al-Sham threat to Assad’s regime and apparently miscalculated when he announced the withdrawal of Russian troops from Syria on Dec. 6 last year after the defeat of Islamic State. Since Putin’s announcement, the Sunni Islamist rebels in Idlib have stepped up their attacks on Russian targets resulting in the death of two Russian soldiers on the Hmeimim air base in Latakia, which was shelled by mortars on Dec. 31. On January 6, Hmeimim was attacked again, this time by a swarm of crudely constructed drones which according to Russian military, were coming from Muwazarra, a Sunni village 50 miles away from the Russian air base in Syria, and launched at the Russian air base on Erdogan’s orders. The mismatch of interests between Turkey on one hand and Iran and Russia on the other will probably result in the failure of the Syrian peace summit in Sochi which is scheduled for January 30 and 31. Regardless of the outcome of the Sochi peace summit, the future of Syria and the success of the Iranian attempt to take over Syria and to transform it into another client state of Tehran will not be decided in the Russian Black Sea resort, but on the ground in the former Arab Republic. As Netanyahu revealed this week, Iran plans to bring another 100,000 Shiite fighters to Syria on top of the 125,000 who are already fighting in the country on behalf of Iran and the Assad regime. Then there were remarks made by IDF chief of staff Gaby Eisenkot who last week called the Iranian threat “multidimensional” and said the Islamic Republic invests $1.5 billion annually in its proxies in Iraq, Syria, Lebanon, and Yemen. This week’s IAF strike in Syria, the series of security cabinet meetings, the reports about the Hezbollah's steady progress along the Israeli border on the Golan Heights and Netanyahu’s new diplomatic offensive could, therefore, be an indication Israel is signaling that it is losing patience with the world’s passivity in light of the Iranian aggressive moves in Syria. Israel may be preparing the ground for military action in the country.